Celebrities stepped out on the red carpet at the 50th Annual CMA Awards carrying Tyler Ellis clutches! Karen Fairchild from Little Big Town went for a monochromatic look in a navy gown with a Tyler Ellis Lee Navy Satin clutch. 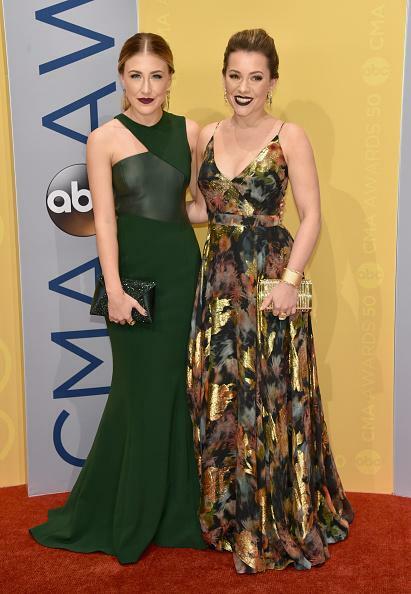 Maddie & Tae's Maddie Marlow accented her emerald green gown with Tyler Ellis Lee Green Satin and Crystal Clutch. Tyler Ellis Aimee Clutch in Red Satin (www.tylerellis.com). All of these ladies looked simply fabulous on the red carpet in their outfits. Each selecting a special clutch bag to compliment their look of the evening. Below are a few more fashion blog posts for you to view other celebrities and their clutch handbag choices. Karen Fairchild, Maddie Marlow and Lennon Stella each looked amazing on the red carpet at the CMA Awards. Was it their clutch bags that made them look so good?